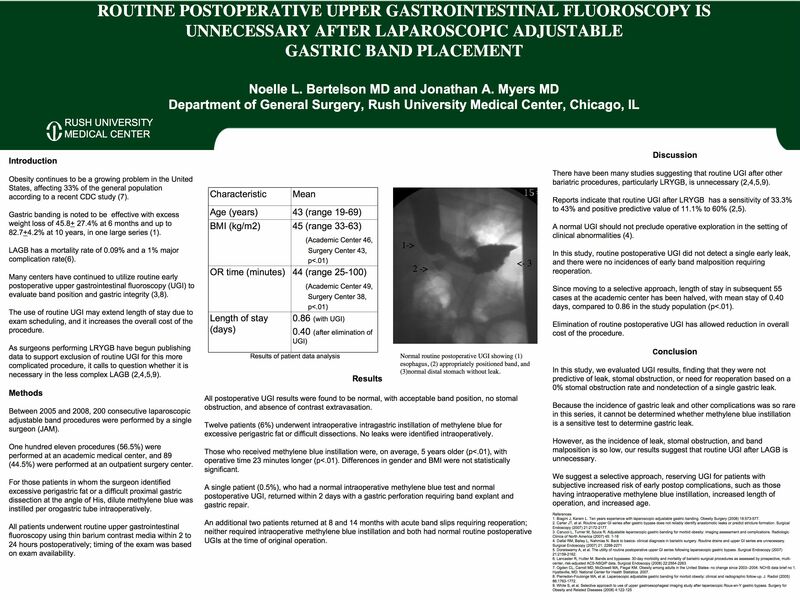 The purpose of this study is to determine whether routine postoperative upper gastrointestinal fluoroscopy (UGI) is necessary after laparoscopic adjustable gastric banding (LAGB). LAGB has become an accepted procedure for weight loss surgery, particularly because of decreased operative time and fewer early perioperative complications. Many centers utilize UGI to ensure stomal patency and gastric integrity at the banding site. However, UGI increases the cost of the procedure and may increase length of stay due to exam availability. Methods: A prospective database of 200 LAGB cases performed by a single surgeon over three years was reviewed; follow up ranged from 4 months to 3 years. Patients with a difficult dissection underwent intraop instillation of dilute methylene blue (MB) per orogastric tube to diagnose gastric injury. All patients underwent UGI 2 to 24 hours after surgery, dependent on exam availability. Cases were reviewed for age, gender, BMI, comorbidities, operative time, MB usage, abnormal UGI results, and complications. Differences between those who received MB and those who did not were compared using Student’s T-test.